MOV Converter supports converting MOV to WMV and AVI. ImTOO MOV Converter is the powerful QuickTime MOV converter software which can convert QuickTime MOV to WMV, MOV to MPEG, MOV to DivX and MOV to AVI format, especially convert QuickTime HD video. It also supports converting MOV files to audio formats like MP3, WMA, AAC and WAV. If you are searching for software to convert MOV to other videos, ImTOO MOV Converter is surely your best choice. 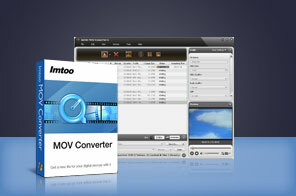 ImTOO MOV Converter is a QuickTime MOV converter which helps you convert QuickTime MOV to MPEG, QuickTime QT to MPEG. It supports batch video conversion for these video formats including AVI, MOV, WMV, MEPG-1 and MPEG-2. If you have problems with the Windows Media player playing an MOV file, than the QuickTime MOV Converter is really what you need! With the MOV converter, you can not only convert MOV to AVI, MOV to WMV and MOV to MPEG with excellent quality, but also customize video/audio settings. With the powerful built-in Quick Time video decoder, ImTOO MOV Converter supports almost all MOV/QT files and HD Quick Time files. Convert MOV Quick Time to AVI, MOV to MPEG-1, MOV to MPEG-2, MOV to DivX, MOV to WMV, HD MOV to MPEG. MOV to MP3 converterConvert MOV Quick Time to audios like MP3, WAV, WMA, AAC, e.g. MOV to MP3, MOV to WMA, MOV to WAV. Support for multi-core CPU technology is designed to make the most of your CPU and speed up the video conversion. Resizable player and adjustable aspect ratio (4:3 and 16:9) are available. Batch conversion and multithreading help you convert multiple files all at the same time without time-and-time clicks. Able to split one MOV file into several and convert any segment of one file by entering the start time and duration. Change basic and advanced parameters like bit rate, frame rate, and codec to get a better output quality. Compress your MOV videos with the help of Bitrate Calculator by specifying the output file size you want. Add multiple profiles in the same or different formats for one MOV file and convert them at the same time. Run the MOV Converter in the background when converting; auto shut down the computer when the job is complete. Support playing the output video files for preview with the built-in player, where you can also view file information. Capture your favorite movie images for Quick Time video files and save as JPG, GIF, PNG, BMP files. How to add subtitles to videos?